Caribbean jazz drummer Johnbern Thomas remembers the dates that changed his career much like any other musician. He remembers the Sunday in 1999 when, at the age of eight, the pastor of his church pulled him aside to say “God has a project for you,” asking him to play in what would be his first ever public performance. He remembers January 28th, 2010—the day he left the only home he’d ever known to try and earn a living in a country where he didn’t even speak the language. And he remembers how, two weeks earlier, on January 12, he was concentrating so hard practicing riffs from a West African Roots book by Royal Hartigan that he didn’t notice the 7.2-magnitude earthquake that would postpone his dreams of becoming a jazz star in Haiti. Click HERE to read the full article as it appeared at JazzTimes. 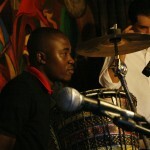 On a rainy Sunday night in Port-Au-Prince, Haiti, jazz instructor Claude Carre sits down with his guitar on a small stage alongside two of his students, playing drums and bass. The audience of 15 or so wealthy Haitians and foreigners at Café des Artes don’t seem to notice when the house music gives way to the sounds of Carre and his trio playing a soft acoustic number. Ever since the 7.2-magnitude earthquake hit Haiti last January —leaving some 230,000 people dead and displacing 1.3 million more to tent cities—Haiti’s musicians have struggled harder than ever to find audiences. In addition to the immediate human suffering, the earthquake also put a long-term dent Haiti’s fine arts culture, including its delicate jazz scene. “I don’t know if after that, the jazz scene is going to expire,” Carre said. Click HERE to read the full article as it appeared at Jazz Times.